Whether it’s French waltzes, poignant interpretations of gypsy folk music or the swinging standards of the Hot Club of France, guitarist Tommy demonstrates technical mastery, compositional creativity and sensitivity beyond his years on his original 1939 Selmer guitar. 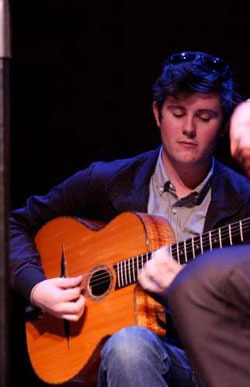 At just 24 years of age, he has already performed with the greatest Masters of the Gypsy Jazz Genre, such as Opus 4, Serge Camps, Samy Daussat, Florin Niculescu, Tcha Limberger, Lolo Meier, Andreas Oberg. His vast repertoire also includes Romanian, Hungarian Yugoslavian and Russian traditional folk music. He is one of the rare few who know how to play in these styles within the genre. Since 2006 Tommy has toured with with David Grisman, Stephane Wrembel, Angelo Debarre and Robin Nolan to name a few. Davy and his ensemble have been featured at Djangofest Northwest, Djangofest LA, Djangofest San Francisco, Djangofest Colorado, Bimbo’s 365 Club and NY Birdland’s Django Reinhardt Festival Tour. Tommy attended California Institute of the Arts music program and studied guitar with Larry Koonse and Miroslav Tadic. His devotion to his music has taken him to far away destinations such as Osaka, Hamburg and Paris. Tommy resides in Los Angeles and currently performs with his Jazz Manouche ensemble, The Tommy Davy Quartet and classical/jazz crossover group Trio Dinicu.